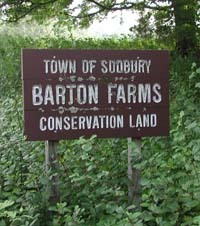 The Barton Conservation Land is the remainder of what was once 128 acres of farmland. It was acquired by George Barton in 1850 from Israel Hunt. The farmhouse was built by Israel Hunt in 1801. The barns across Marlboro Road from the farmhouse were built in the mid 1800’s. The smallest barn, located on the north side of the two larger barns, was the original post office for North Sudbury and was formerly located at the depot between Haynes and Pantry Roads. The original barns were completely destroyed by fire in the winter of 1846, making the present barns a second set for the farm. The individual fields were each given a name so that family and hired help could easily locate areas. As you follow the trail that begins at the parking lot, you will be able to recognize each field by its name. The first field, “Three Corner Piece” abuts Marlboro and Haynes Roads and is adjacent to the parking lot driveway. On the left is “Noyes Hill” and on the right is the “Maple Grove”. Maple saplings were sold from here to other area farms. Continuing south on the trail you enter “Noyes Flat”. As you head toward the woods you are on “Noyes Island” surrounded by stonewalls, a ditch, and Sawmill Brook in the woods, parallel to the railroad tracks. The trails continue west through the “Rocky Piece” until the brook meets a pond. A former gristmill ran on the south side of the pond. At one time, the farm continued to Mossman Road where a few distinctive landmarks from yesteryear still remain.